It’s a bizarre sight: At Broadway and 215th Street, amid an unremarkable stretch of neighborhood shops, sits a marble arch straight out of Gilded Age New York City. 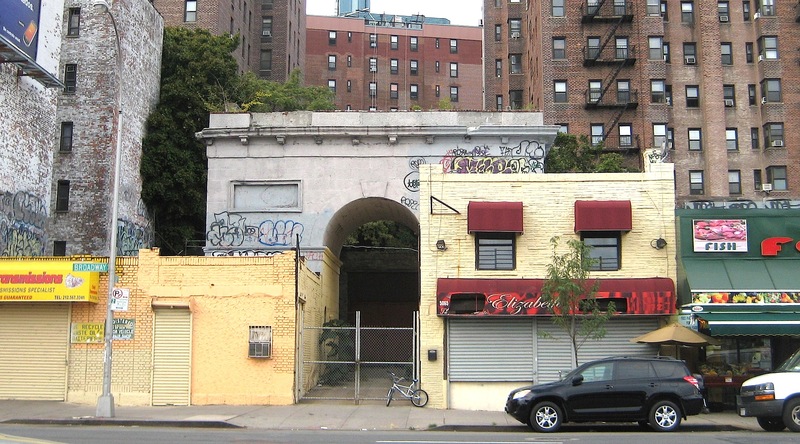 The arch (New-York Historical Society photo, right) is marred by graffiti and litter, closed off behind a chain-link fence. So what’s it doing there? Known as the Seaman-Drake Arch, it’s the last remnant of the Seaman Mansion, a magnificent 19th century hilltop home built by the Seaman family, when Inwood was dotted by country estates. 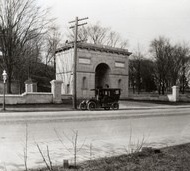 The arch marked the entrance to the mansion, which was later sold to a family named Drake. As Inwood lost its rural character, the mansion was razed; on the site now is the Park Terrace apartment complexes. Myinwood has more in-depth history and photos. And Gothamist found an incredible shot of the original mansion and gate. This entry was posted on October 6, 2010 at 5:33 am and is filed under Upper Manhattan. You can follow any responses to this entry through the RSS 2.0 feed. You can leave a response, or trackback from your own site. I had always wondered what that was!! Thank you! Very sad … so many beautiful things which have been laid to waste. Thanks for writing about this. It’s one of the great surprises and treasures of Inwood. It’s true that sites associated with the wealthy are often preserved over sites associated with the working classes. On the flip side, however (and to Bookpod’s point), wealthy Americans have tended to grow tired of their possessions quickly. The mansion on the old Billings estate (now Ft. Tryon Park), which housed dozens of servants, racehorses and cars, was sold by its owner after little more than 10 years, I believe. It finally burned down around 1917.